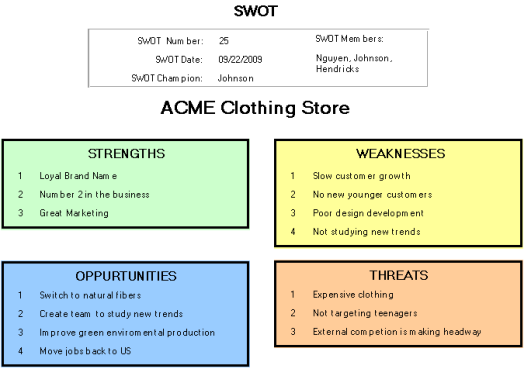 SWOT analysis sample is a technique whereby a business' internal and external environment is assessed to determine its strengths and weaknesses. Those factors that are affecting the business internally are Strengths (positive) and Weaknesses (negative), denoted by the letters "SW" in the acronym, and those factors affecting a business externally are opportunities (positive) or Threats (negative), denoted by the letters "OT" in the acronym. Determining what the factors are, thus establishing a sort of blueprint, is known as SWOT analysis. So let's say, for example, that your business needs to review its marketing strategy for its established clothing line. Using SWOT analysis, you first determine what your business' own strengths and weaknesses are within its marketing department and within the strategy overall. First, focus on Strengths. What within your marketing strategy is an advantage for you? Let's say, for instance, that you are already doing well with your particular brand in that you are functioning at number two. You also have an advantage over other competitors in that customers are very loyal to your brand so that you're not likely to lose that base. Next, let's look at Weaknesses. While a strength is that your brand has been around for a while and has a very loyal customer base, you haven't done so well at bringing in new customers from new demographic areas, such as younger consumers. In addition, because you can count on your basic customer base to continue to buy your brand, you haven't worked very hard on developing new designs or tapping into new trends to bring in new customers, while still meeting the needs of your established customer base at the same time. What opportunities does your business have? Your company needs to place emphasis on domestic job growth. You need to improve "green" jobs, and environmentally friendly practices. You can do this by manufacturing domestically and stop sending jobs overseas. In addition, the company could switch to natural fibers such as cotton that rely less on fossil fuels. What threats does your company face? Your clothing is more expensive because of your brand name marketing. This could reduce customer in the future. Your clothing does not target teenagers. Teenagers turn into adults and they may forget your name. External competion is making headway. Afer reviewing this page on SWOT analysis sample, see here for step by step instruction on making a sound SWOT.